Let’s make May a month to remember!! 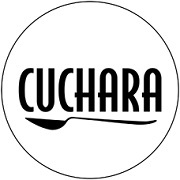 Cuchara, an authentic Mexico City bistro that opened its doors with an above and beyond Mexican independence party on September 15, 2012, occupies the corner space at Fairview and Taft. The 1940s brick building used to house The Hyde Park Supermarket. The restaurant was conceived by Ana Beaven and Charlie McDaniel, and designed by Jim Herd and his team of Collaborative Projects. It has a modern, open aesthetic, which is juxtaposed with jolts of color and texture in the rainbow-hued plates and bowls, and rough-hewn half-aprons worn by waiters that reference the menu’s Mexico City origins.